A gunman killed 12 people, including sheriff Sgt. Ron Helus, after opening fire at a bar in Thousand Oaks, California, late Wednesday. The suspect, identified by police as Ian Long, 28, was also found dead at the scene. Police officers headed to Borderline Bar & Grill in Thousand Oaks, a city located about 40 miles northwest of downtown Los Angeles, around 11:20 p.m. after receiving multiple calls of shots fired, Ventura County Sheriff Geoff Dean said. It was "College Country Night" at the bar and the dance floor was full of students from nearby universities. A sheriff unit arrived three minutes later, followed by two highway patrol officers. Helus, a 29-year veteran, and a patrol officer went in through the front door, at which point Helus was struck multiple times with gunfire. The patrol officer rescued Helus out of the line of gunfire, but Helus later died from his injuries. Additional units arrived and recovered a single handgun, Dean said. Multiple people with different levels of injury were rescued and taken to local hospitals, and other people with minor injuries took themselves to hospitals. "It's a horrific scene in there," Dean said, adding that people were found hiding in bathrooms and attics. He described Helus as a "hard-working, dedicated sheriff's sergeant. He was totally committed. He gave his all, and tonight, as I told his wife, he died a hero. He went in to save lives, to save other people." Long, a U.S. Marine Corps veteran, likely shot himself, Dean said Thursday. He purchased the handgun and extended machine he used during the shooting legally. Police had met with him earlier this year but he wasn't arrested. Dean didn't provide additional information about the gunman but said no links to terrorism had yet been determined. Borderline, which bills itself as the "biggest dance floor in town," is a popular spot for college students from nearby California Lutheran University, Moorpark College and Pepperdine University. Capt. Garo Kuredjian of the sheriff's office told reporters that "hundreds" of people may have been inside the bar at the time. A witness told KABC-TV that there were many young people "having a great time" in the bar when a man entered and began shooting. The witness, who escaped unharmed with his stepson, said he saw the gunman shoot multiple people. 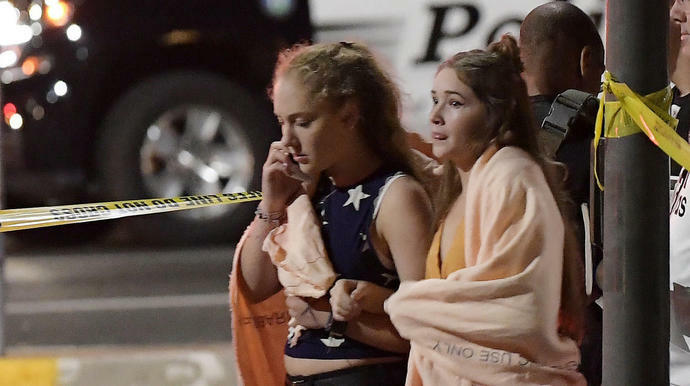 Students who were at the bar at the time described how many worked together to keep each other safe. Teylor Whittler, 19, told ABC 7 News that students piled on top of one another toward the back of the room once shots rang out. She escaped after people threw bar stools in order to break the window, which allowed people to leave and hide behind bushes up a hill. Kuredjian described Thousand Oaks as "a very safe community." Shootings don't "happen very frequently in our neighborhood," the officer said.